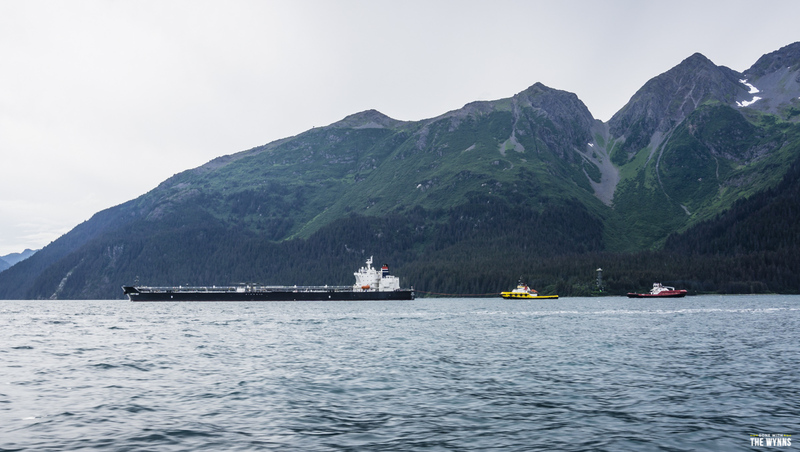 Valdez, Alaska sits at the end of the Trans-Alaska Pipeline and the Richardson Highway, miles from anywhere. It’s one of those towns that seems like a simple fishing village but its history is one of perseverance. This town has recovered from an array of rough patches throughout it’s time. There are scars from battles during the gold rush era, a damaging earthquake in 1964, Volcanoes, Glacial Landslides and probably the most famous of all its woes is the massive Exxon oil tanker spill in 1989. Now the plant and animal life have nicely rebounded and its home to an abundance of wildlife. 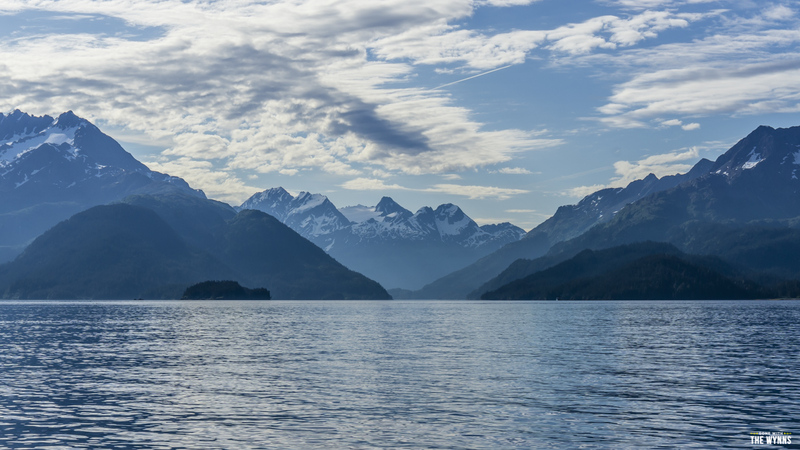 Plus, its location at the head of a fjord in Prince William Sound make it an outdoor lover’s paradise (aka, our kinda place). We could have easily spent our time paddling around the tiny islands and hiking the stacked mountains in every direction but we came here on a mission…a fishing mission (and why not, even the deadliest catch crews are here)! I feel the need to make a big disclaimer before we go any further. We have only fished with family or friends occasionally here and there and before coming to Alaska, we didn’t even own a fishing pole. But we’re passionate about foraging, living off the land and very much want to become capable fishermen. 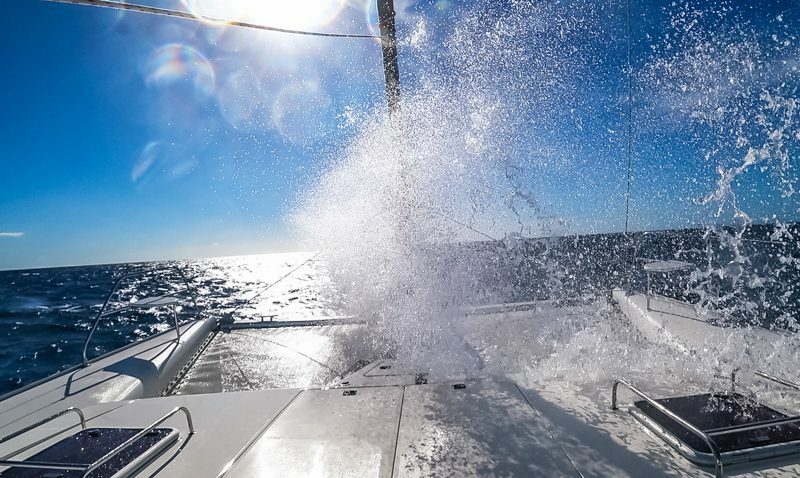 So we’re taking every opportunity to learn, and in our opinion, there’s no better way to learn than spending some quality boat time with the locals. 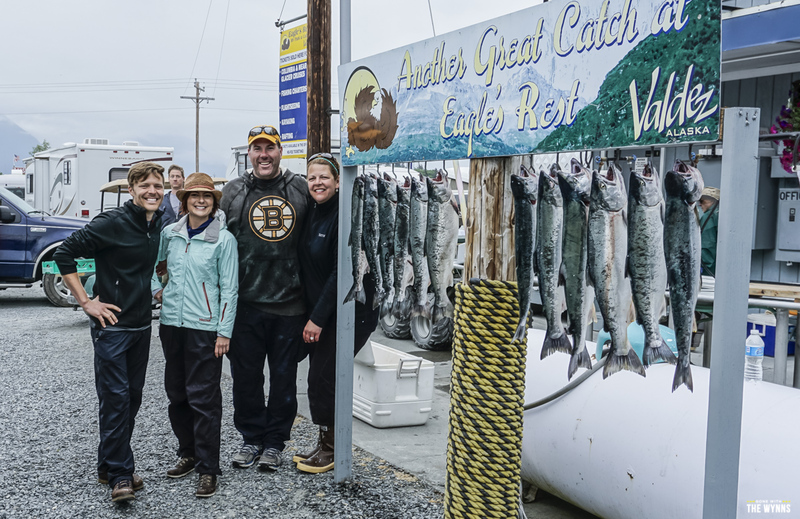 It just so happened that our Alaskan friends Bonnie and Chris were in fishing in Valdez with friends for one of their many summer trips. Each year they load up their RVs, boats, gear and meet up here to fill their freezers with enough salmon and halibut to get them through the winter. Luckily, Alaskans are incredibly welcoming and a couple invited us, two strangers, to bring our newly purchased gear and inexperienced (but very excited) selves to join in on the adventure! A huge thanks to Greg and Danielle for the boat tour, teaching us the salmon fishing ropes and stuffing our freezers/bellies for the winter too! 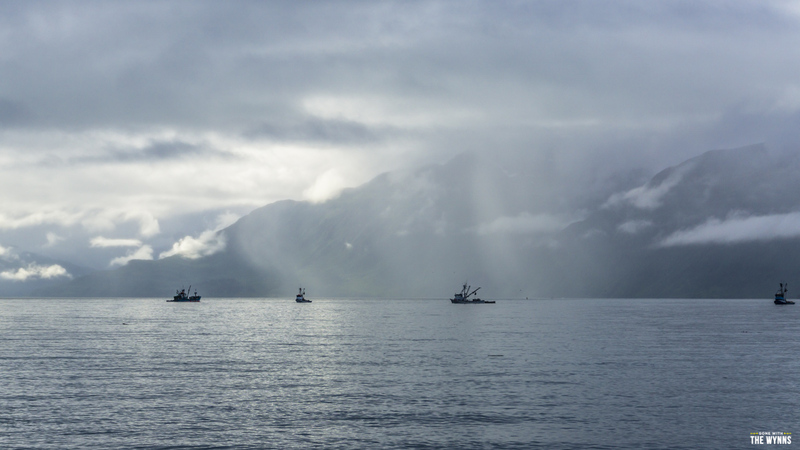 We learned a lot about salmon while in Alaska…and not just the fishing part. Our minds were blown by just how in the dark we really were. So, for all you fellow salmon lovers who have not been salmon fishing yet or even for those that buy at the market, here are some pearls we’ve picked up here in Alaska. Chinook / King Salmon – The biggest of Salmon, the most prized and most difficult to catch. Sockeye / Red salmon – A prized catch and the Alaskans we met loved this fish most for its deep red flesh. Coho /Silver Salmon – A desirable fish known for being a fun catch and good eatin’ with their tasty reddish orange flesh. Pink Salmon – Most Alaskans we met wouldn’t eat this fish nor keep them. They would even say, “Friends don’t let friends eat pinks”. It’s a milder flavor with a light pink flesh. What blew our minds is Pink Salmon is what most of us get at the market in the lower 48 (wild Alaskan salmon, Atlantic salmon…) unless its specifically noted as Coho, Sockeye or Chinook. Now, we’re not that spoiled and we’re perfectly happy to catch and eat a pink salmon (when our Alaskan friends aren’t around that is). Chum / Dog Salmon – Known as “dog salmon” because of their teeth and canine look during spawning. They have a softer flesh (some say mushy) and are generally not considered a desirable table fish. However, it is commercially caught so who knows how many times we have eaten it not knowing any different. 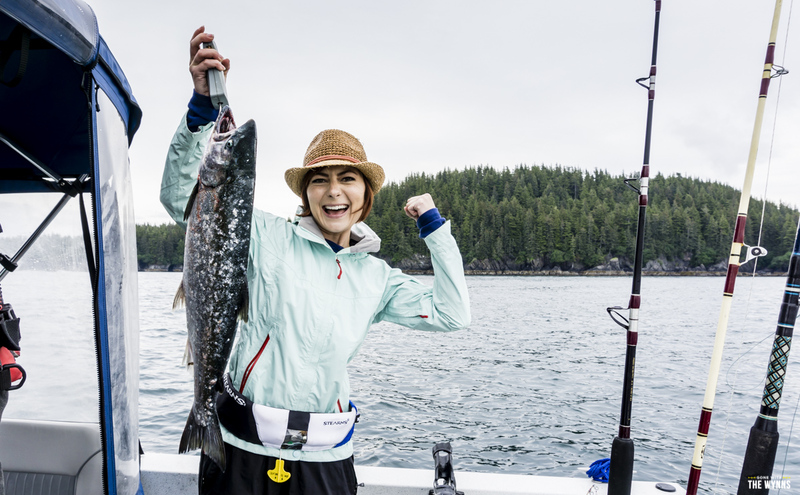 After our incredible salmon fishing experience, we were hooked and wanted more. This time however, we wanted in on the halibut action. So, we started asking around the group and bingo! Eric and Lenny invited us to join their boat (sorry, I was so excited I forgot to get a photo of them). It was a perfect day, blue skies, white fluffy clouds and glassy waters. 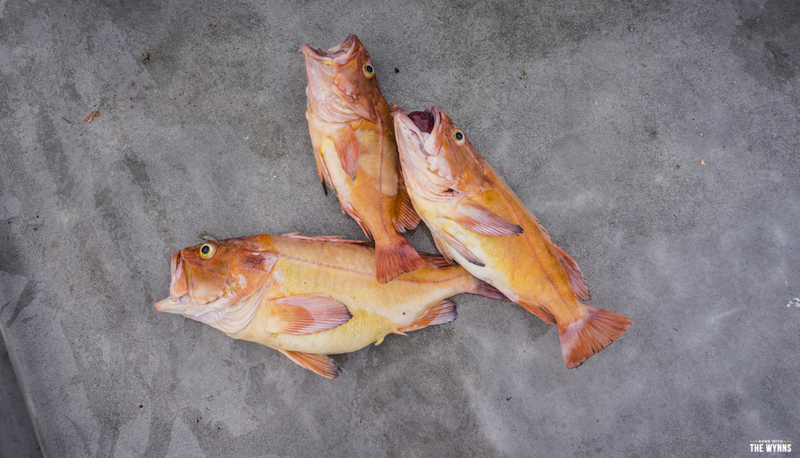 While we went in search of halibut (we didn’t catch one) what we were reeling in was yellow eye rockfish! Those things are like reeling in boulders and come up with big bulging eyes, tong’s swelled and poisonous spikes out! True punk rockers! Yelloweye are one of the world’s longest lived fish and can live to be up to 140 years old! They can also be easily overfished because they take a long time to reproduce. However, because they come from deep waters, once you have reeled them up, they won’t likely survive if you toss them back. You’d think by now we would have had our fill of fish…but nope! We headed over to Allison Point and the fish hatchery. It’s supposed to be the place to see bears feasting on salmon and a great place to toss a line in and catch some pinks. While the views were stunning, sadly there were no bears despite the swarms of fish. However the sea lions were in hog heaven and it was quite the show! They were literally rolling around in swarms of pink salmon biting off heads and throwing back the bodies. It was a vision of true happiness and gluttony. We did catch pinks here and is a great spot that doesn’t require a fee or a boat ride to get to. However, if you don’t meet any locals willing to take you out and you can spring for a charter I think it would be worth it! We stayed at the Eagles Rest RV Park because we wanted to hang with our friends and that is where they stay. 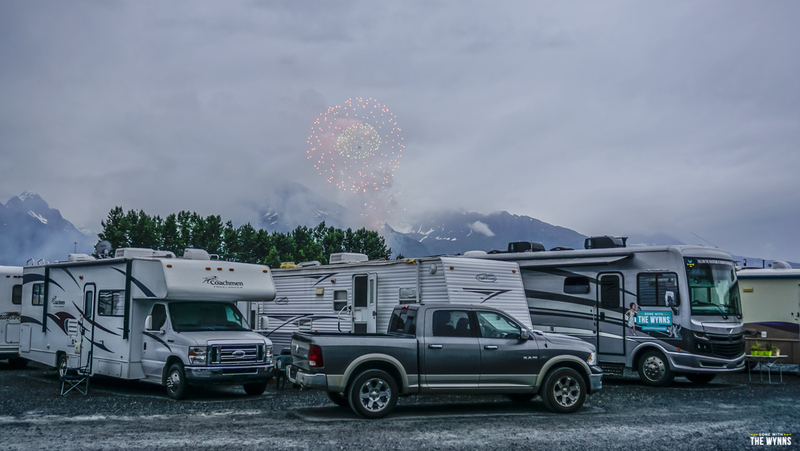 It’s nothing fancy and essentially a parking lot but so are the other in-town RV parks. We celebrated the 4th of July here enjoying our freedom, eating fresh salmon and spending time with all our new friends. It was all wonderful, but I have to say…watching fireworks in a part of the country where it doesn’t get dark is a strange experience. Lu-Lu Belle – Lots of our fellow full time RV’ing friends took this scenic tour and every one of them loved it. 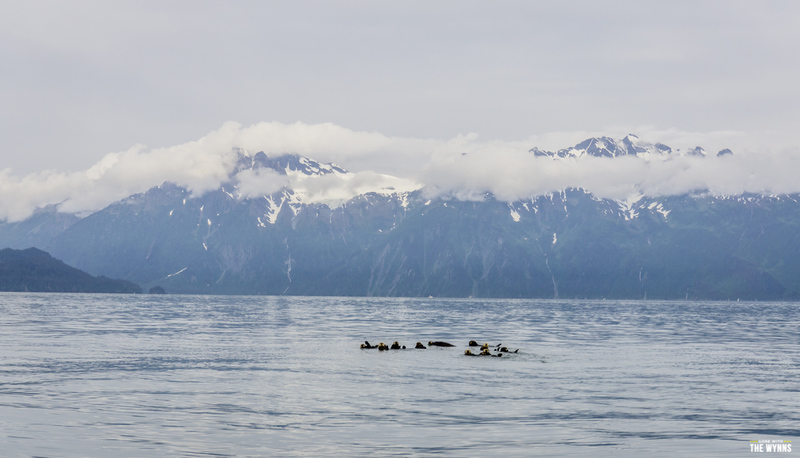 They got up close and personal with lots of wildlife, glaciers and came back with lots of Valdez folklore stories. We didn’t have the time but will definitely do this excursion on our next visit! SUP / Kayaking – There are so many little islands to explore and when the weather is nice, the water is like a big teal mirror! If you love paddling then this would be a great place to explore. There’s even a public use cabin a day’s paddle from town. Hiking – This whole area is an outdoor lover’s paradise and much of it can be explored on foot. There were a list of trails that we would have loved to take. Make sure and stop by the visitor’s center for current trail maps and conditions. Fuel Prices – Fuel around the area hovered in the realm of about $3.60 – $3.70 a gallon. For the most recent pricing, check out the free Gas Buddy app. Road Conditions – The roads in and around Valdez were well maintained. Weather – We had a couple of glorious sunny days and some drizzly misty days with highs hovering in the low 70’s and the lows in the upper 40’s.  Resources – We purchased a medium action pole (Alaskan friend approved) that worked great and seems to be a good investment for long term use. We opted for quality fishing line, and borrowed a diver and a flasher from our friends. The fresh bait of choice was herring and was only $19 for the big bag of frozen which lasted for a week! When fishing for the pinks, we used a pixie. 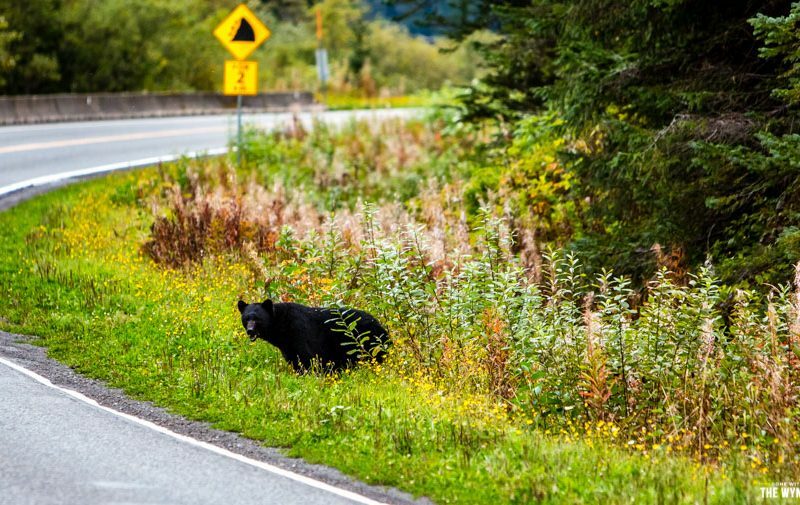 Have you been to Valdez?  Share your stories, tips and suggestions with us in the comments below. The more we all share the more adventures we’ll all have! Hi! Thank you so much for documenting all of these amazing pics and travel tips! We are a family of four headed to Alaska August/Sep 2018. We plan to do a lot of shore fishing.Are there many places to rent fishing equipment and is it affordable or is it worth it to buy the medium action rods you recommended? We would only use them for Alaska. 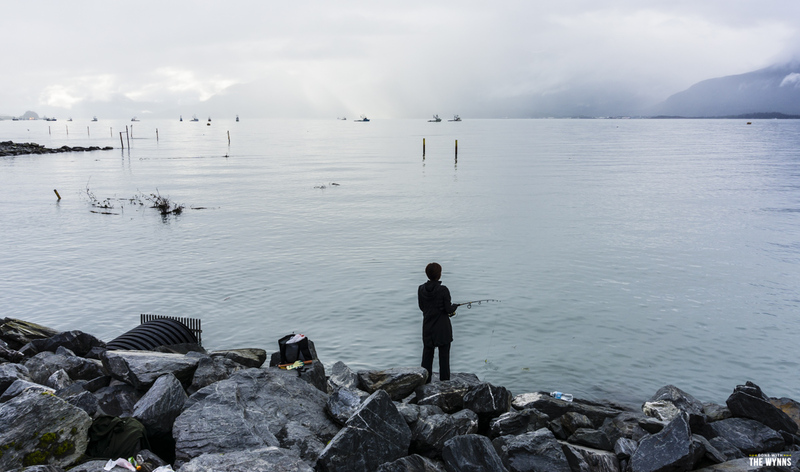 We spent a summer in Alaska and did a lot of fishing but never saw a place that rented gear. 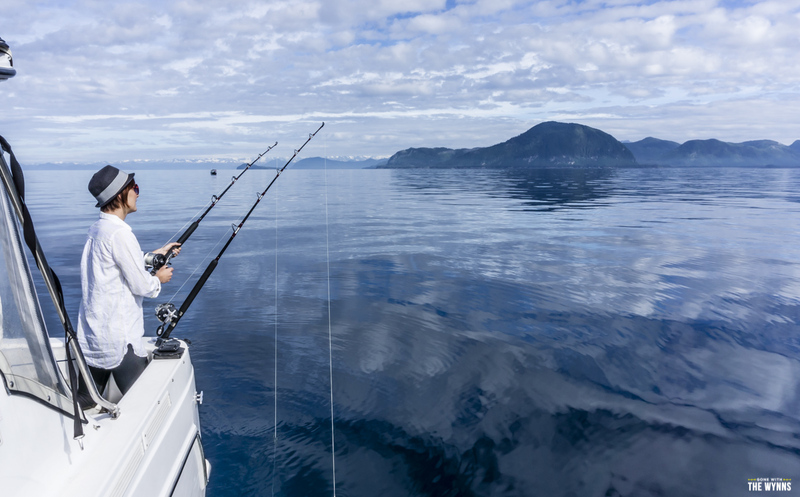 Your best bet might be to head to a Fred Meyers sporting goods department, tell them what kind of fishing you want to do, and they should be able to set you up with what you need. Enjoy the trip! Found a video about the Alaska pack, (doing research on it) and started watching your videos! We are from Alaska and just started RVing this last spring. 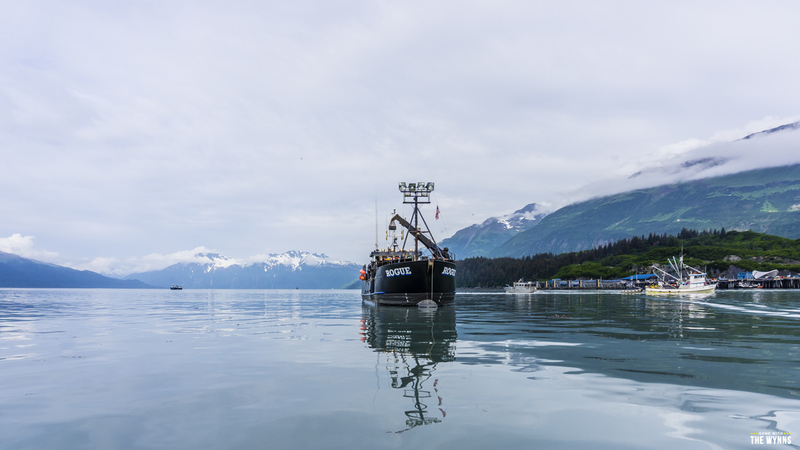 Love the video about Valdez Alaska as you got a blip of our business Easy Freeze, Inc. Where you bought your bait from. It was kind a neat seeing a visitor’s perspective of our little world here. If you ever make it back down this way stop in and say hi. Psst we can hook you up with an awesome halibut charter! Have thoroughly enjoyed following your Alaskan road trip as we traveled most of the same roads this year! We are back home in California and find it bittersweet-I was a bit teary to see the Ultmate Road Trip come to an end. But as we hit snow in Destruction Bay and saw very few remaining travelers (compared to July) we knew it was time to head back. A circuitous route found us going through Jasper, Banff, Glacier and Yellowstone before finally heading directly to Calaveras County and the horrible fire that broke out while we were on our way back. All is well at our home but it’s so sad to hear the terrible stories of homes lost. 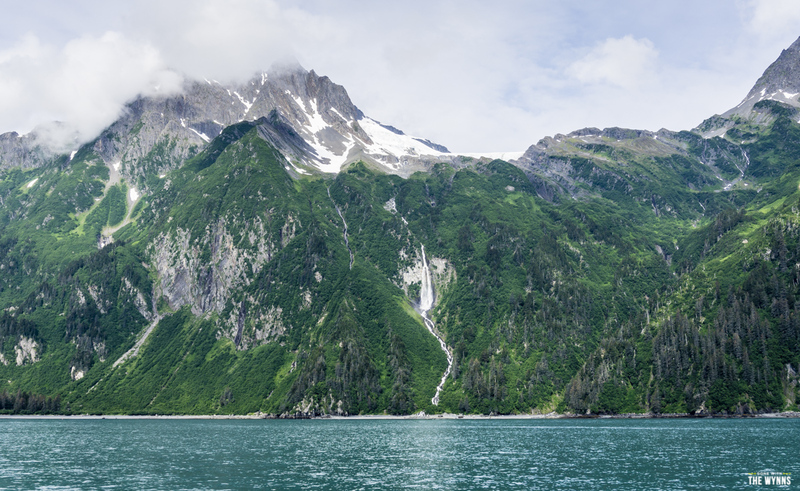 There is something about Alaska…we hope to go back. We are seniors and made this trip to ensure it got checked off the list! Now we are hoping to return in two years with a nephew and his family. What a treasure that would be! Good luck on your return. Keep the stories coming. Next fall we are doing a repeat trip to the east coast plus Nova Scotia. If you have time, check our blog. We are Two B’s on the Road at lovingtheroad.blogspot.com. Hi Nikki! We have both just retired and have just bought a Seismic toy hauler to travel the country in, along with Canada. We plan on going to Alaska next year, leaving New Mexico and meandering that way starting in May until maybe August, who knows. I have watched some your videos and enjoy them, especially the border crossing. My questions are….at this time of year how many daylight hours did you have and are you going to try to catch the “Northern Lights” at some point in time? Summer months are hard but maybe in Canada? As for us, in the beginning of our retirement we are intending to go to Rocky Point also know as Sonnorra (Mexico) for two months over Thanksgiving and Christmas. Check it out! It’s a favorite place for Phoenicians (Phoenix, Az) to go, went there all the time when I was a kid. $600.00 a month for an ocean front spot with full hookups. Only 60 miles in and not like the other bad border crossings we here about. I have friend and relatives who travel there by car who have no problem! Nikki and Jason, we discovered your blog about a month ago as we were looking for motor home reviews. Have since been reading and watching a lot of entries. You’re an inspiration and we are finally going to get back into camping and bought a Minnie Winnie to get started! Thanks for sharing your adventures and all the great tips. Congrats guys and welcome back to the world of camping and RV’ing! I’m really glad you took the time to visit Valdez. What did you think of the drive over Thompson Pass? Did you make it down to Chitina? Great work and I really love watching your videos. Any chance you’ll someday put together a DVD of this adventure? As for our Alaska adventures we have been documenting the entire trip and do plan on putting together a full length piece hopefully in the spring (at least that is the plan anyway)! Hi Nikki andJason! Just started reading your blog and watching your videos a couple of weeks ago. My husband and I are hooked!! Your adventures look amazing and you have inspired us to get off the couch and start exploring!! Please don’t stop sharing….photographs are amazing!!! ? Oh Patti, “you have inspired us to get off the couch and start exploring” is the best compliment we can get and exactly why we share! Thanks so much! We met Jason along the Glenn Highway near King River. Alaska was a lot of fun for us too. We want to go back. It truly is the last frontier. One of our favorite states for sure and a trip that shouldn’t be missed! So glad you experienced it with us this summer and loved it as much as we did! Reading this brought great memories to fishing in Valdez 10 years ago. We came to the Copper River area for Kings but were too early for their run. We had great success with our halibut trip and we were definitely not too proud to catch a bunch of pinks by the hatchery. Looks like you had fun too! Great video. I have watched every one of the videos you have made and really enjoy watching you two. This trip to Alaska has planted a bigger seed in me to head north. I can’t thank you enough for sharing your adventures and making them so entertaining and funny. Thanks so much for joining us! I do hope you make the trip yourself! We have had a few people share their jarred salmon with us and its great! If we were set up for canning I would have loved to have made some. Kia ora from New Zealand, hot smoked salmon is very easy to do, we just put a smoke box (or you could use a pan, cake rack & tin foil) on the bbq & turn it on. Once the smoke appears wait 5-10 minutes (depends on how “cooked” you like your salmon) take off – leave for around 15 min for the smoke to condense. I make a marinade of 1/2 c brown sugar, 2-3 T salt & a good squeeze of lemon juice then rub on salmon leave for about 20 min (go for a hike/tramp) before putting some wood chips & black tea leaves on the bottom of the smoke box. Thanks for your video, loved the scenery. That sounds fantastic! We keep talking about getting a tiny smoker to carry along and now I really want to get one! Oh, pinks and/or dogs are just fine for smoking. While I have smoked lots of kings and reds, there is nothing wrong with smoked silvers and pinks/dog. I would never bake or BBQ anything less than a silver though. Another excellent video! And I am jealous. While I spent considerable time in Alaska many years ago, I was there only for work and I have never been to most of the places you have been this summer, nor did I have friends who were experienced outdoors people to give me such a wonderful outdoor adventure.. I am happy for you kids. Well, you need to go back! We had almost as much fun fishing from the shore and rivers and caught there too! If you do make your way back, don’t hesitate to just head down to one of the free river hot spots and give it a try. We found everyone to be very friendly and happy to help if we had questions or weren’t sure about our set up or technique. Now that’s a big fish! Have to admit I know nothing about fishing, and very little about the different types of salmon. This was excellent! If we ever make it up to Alaska we are definitely doing this. Oh Nina, the incredible wild camping opportunities and fantastic hikes are sooo your world! Plus, everywhere is very dog friendly so Polly would have a ball! 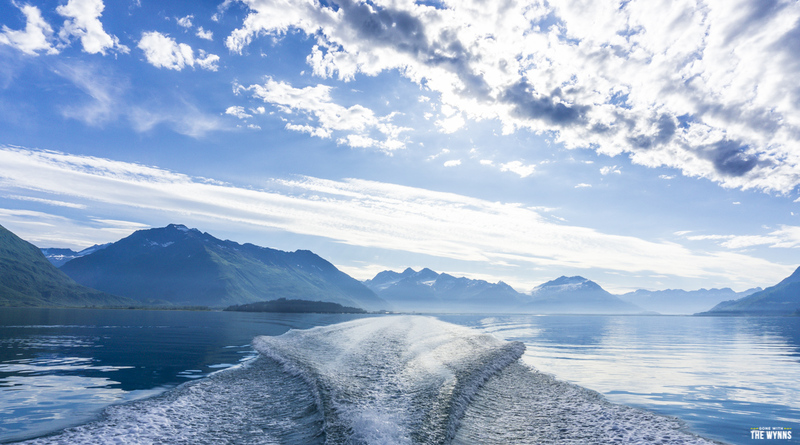 We have been to Valdez twice to visit family and enjoyed going out fishing on a friend’s boat and taking the Glacier boat tour. We stayed at Eagles Rest also on the 4th of July in 2012 and 2014 and enjoyed watching everyone clean their catch. What a great place.. We agree – the fireworks lost their radiance in the dusk, but the big bonfire down by the harbor with the smores and live music was fun. Glad you got to experience Valdez. Love your videos! Whew, I am really glad to hear we weren’t the only ones thinking the fireworks were lack luster. We didn’t catch the live music and bonfire but that sounds awesome! are you going to dry or smoke some of the salmon? it’s almost as good as bacon 🙂 That water was unbelievably glassy, would have been perfect for paddling as long as you didn’t fall in! Nice meeting you guys in front of the 49th State Brewery. Hope your trip down the Cassiar was an enjoyable one. Been snowing off and on in Denali this week you left at the right time…. Hey Tim, I am sad we didn’t connect earlier! Definitely hope to see you this winter! Sounds like you are “hooked” on fishing. Alaska is a great place to get spoiled. I am glad to see that you got back on the water. 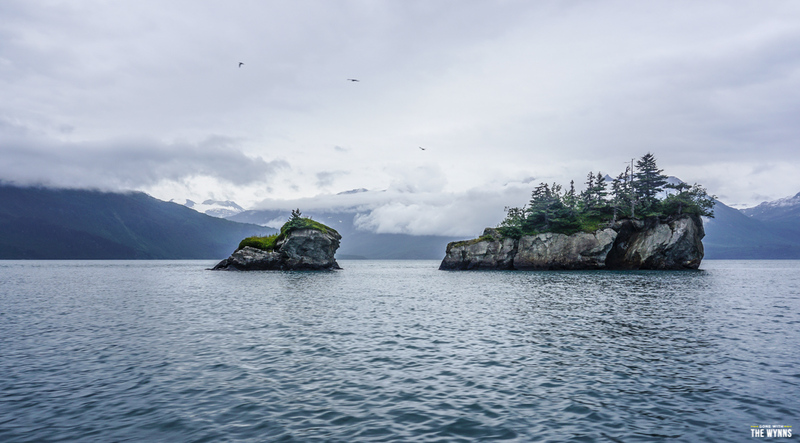 Seeing inland Alaska is great, but seeing it from the water is special. Good for you. Tight lines Alaska fishermen. Boy, do I love salmon. Watching you pull in those fish made me hungry. Loved the video. I am glad you had a great time in Valdez. We enjoy living here very much and love to see other people enjoy it as much as we do. I must say that the video does really show the water side of Valdez very well, and I encourage everyone to experience it as you two did. Beautiful pictures, as usual, and thanks for the good info. But, catching all the fish in the ocean (and lining them up for a photo) is kinda piggish, doncha think? :- ) Save some for me! !